Oh to be a minor character in a reasonable but not amazing Doctor Who episode. Not a Dalek, not a Cyberman, or a Weeping Angel - just, you know, a plot function in a mid-season episode: someone to just help tell the story. 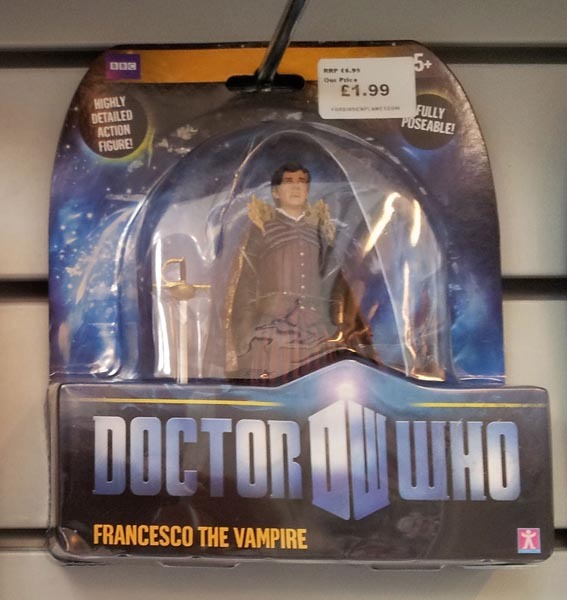 A character that's unlikely to ever appear again; to be forgotten by the general viewing public and perhaps destined only to repeats on BBC Three or a clip on an actor's show reel, and maybe a few convention appearances in a version of the costume they mocked up themselves and got a bit wrong. At best, their character will even have some lines to say, but their story will be over in one episode. 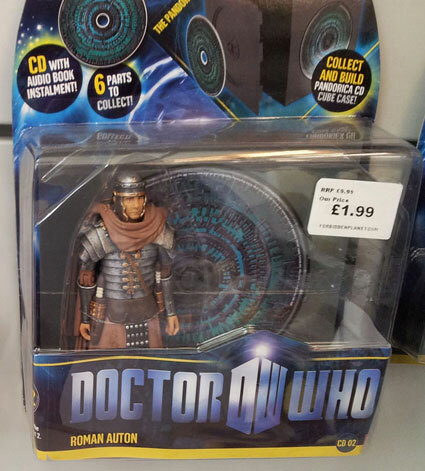 Unless, of course, the character becomes an action figure - everyone loves an action figure, and Doctor Who fans will buy anything, right? Well, wrong, as it goes, apparently. Look at this sorry lot. 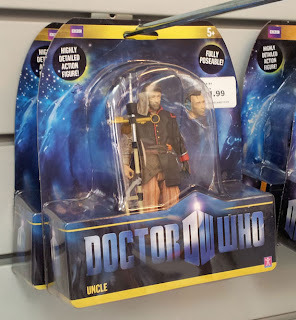 They're the remnants of a sale of Doctor Who action figures at a special shop for people who like to buy expensive stuff about cult and sci-fi film and television. Most people, it would seem. So how did we get here? Is it that the shop ordered too many of these particular action figures - perhaps anticipating a Francesco the Vampire craze, following his appearance in the episode The Vampires of Venice, that ultimately failed to emerge - or is that the fans just didn't want to buy them? Erm.. oh yeah, 'Hawthorne', from The Beast Below. Yeah, we're with you. Knowing basic economics and the issues of supply and demand (they affect us all, readers), we'd guess a bit of both. We haven't really a clue of course, but we thought it might make some nice pictures, and also be a good way to mark our excitement at the new series, whose own minor or one-off characters will no doubt become action figures in due course. 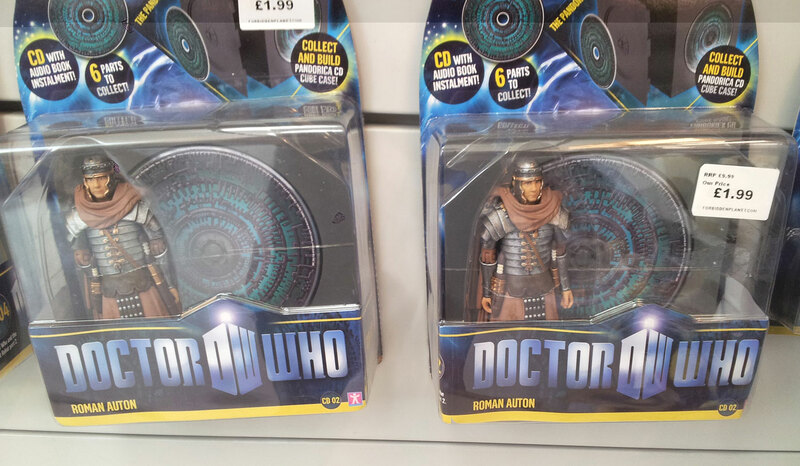 But it's fair to say none of these end-of-stock figures will be making a return appearance in Doctor Who, although tv-ooh reserves the right to be wrong, of course. And it's also a slight relief, if you care about this sort of thing, to note that it is only these one-off, reasonably minor characters that haven't sold. I mean, it's not like there are any money-robbing alternative versions of a Doctor action figure kicking about on special offer, too. 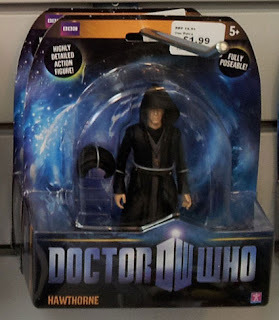 Oooh, it's Ben's birthday soon - he'll have anything Doctor Who related! Is that at Forbidden Planet?